Twins of Genius -- Not! 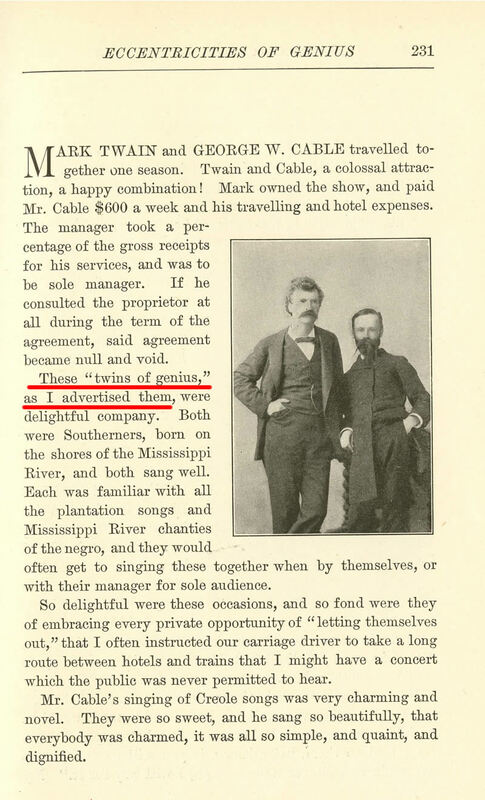 Writers on Mark Twain, myself included, have long been in the habit of saying that he and George Washington Cable were billed as "Twins of Genius" on their 1884-85 reading tour. It's received wisdom, and has become ubiquitous; which makes it all the more regrettable that, as it turns out, Twain and Cable were not billed as "Twins of Genius" on that tour or any other. With today's searchable newspaper databases, we can see how this non-event became established as fact. The unwitting source of the error is James B. Pond (1838-1903). Pond was the promoter of the Twain-Cable tour - and, crucially, the promoter of another tour, at another time, by another pair of lecturers. 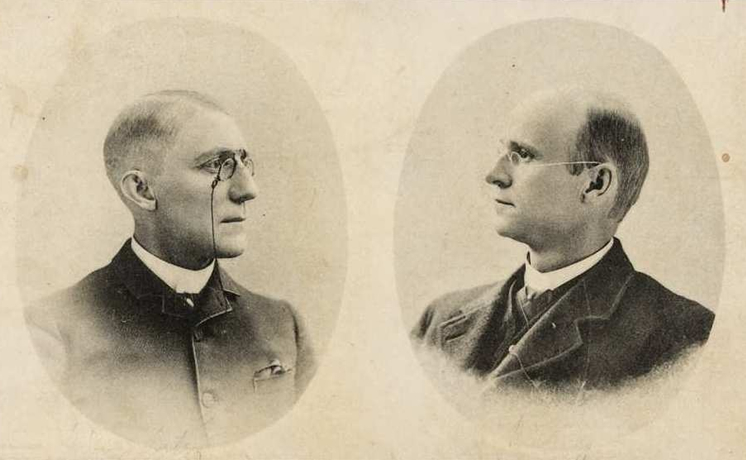 To look at their photos, the team of Clemens and Cable would never have suggested "twins" of anything; but Nye and Riley did. This 1889 photograph shows their natural resemblance; also how they accentuated it with hairstyle and accessories. It may be that Pond's "Twins of Genius" slogan was prompted by something Mark Twain said. Introducing Nye and Riley at Boston's Tremont Temple on 28 February 1889, he played off their mutual resemblance, speaking as if he believed them to be Chang and Eng, the "Siamese Twins." 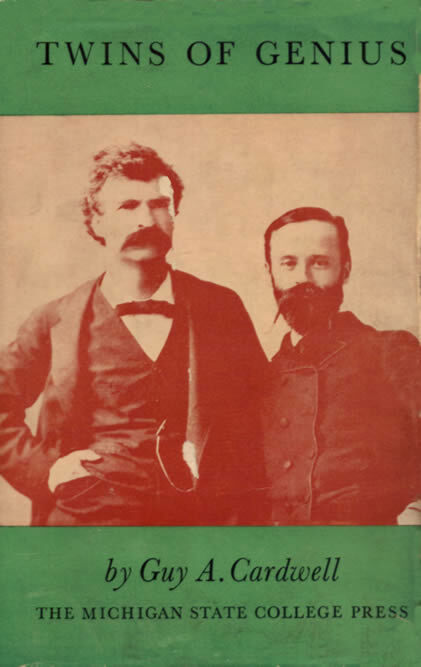 Mark Twain's conceit may have struck Pond as a good gimmick; yet it was clearly undesirable to go around announcing the Siamese Twins only to present Nye and Riley to indignant houses. 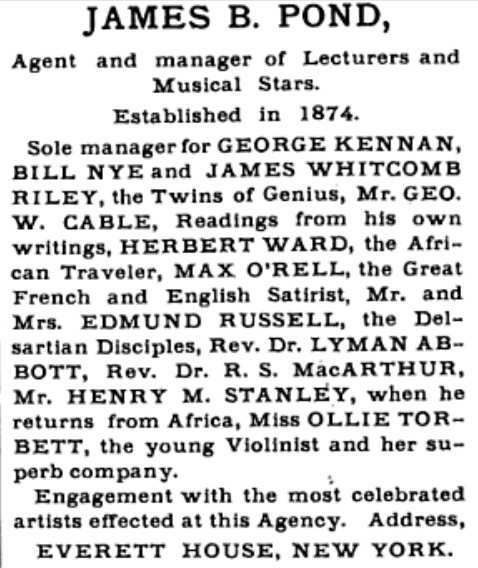 Whether or not "Twins of Genius" represents Pond's variation on a Clemens gag, it is in the Spring of 1889 that we first find Nye and Riley (or anybody) being promoted under that name. The earliest reference found thus far is in the Cincinnati Enquirer of 12 March 1889, page 5. 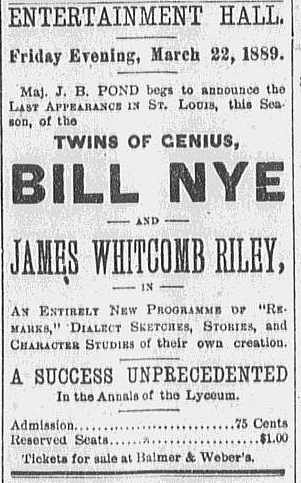 Typical ad for the "Twins of Genius" that appeared in the St. Louis Republic of 17 March 1889, p. 5. I will go partners with you, and I will buy Nye & Riley's time, and give an entertainment something like the one we gave in Boston. Let it be announced that you will introduce the 'Twins of Genius.' Ostensibly a pleasure trip for you. I will take one third of the profits, and you two thirds. It was in his memoir Eccentricities of Genius (1900) that Pond wrote, wrongly, that Twain and Cable had been the "twins of genius" (231). A few pages later, Pond twice applied the phrase, correctly, to "the Nye-Riley combination" (246, 247). The contradiction, not surprisingly, went unnoticed, but Pond had inadvertently planted a seed. When Pond died in 1903, obituary writers ransacked his book for anecdotes, and gave his mistake a large circulation. A half-century later, Guy Cardwell titled his book on Twain and Cable Twins of Genius (1953), enshrining the mistake -- possibly forever. Cardwell gave no source for his claim that "they were sometimes billed" under that heading (3); unwittingly he was following, at however many removes, Pond's page 231. If small errors are magnified by reduplication, then this is now a large error. Constantly repeated, the phrase has become the insidious kind of fact that seems not to require documenting; "common knowledge." But now it's time we squelch "Twins of Genius" in application to Mark Twain and return it to its right meaning. For more information on the 1884-85 tour, which includes tour programs and other ephemera, see the University of Virginia's "Touring with Cable and Huck." Cardwell, Guy A. Twins of Genius. [East Lansing]: Michigan State College Press, 1953. Clemens, Samuel Langhorne (Mark Twain). "Introducing Edgar Wilson 'Bill' Nye and James Whitcomb Riley." In Mark Twain Speaking, ed. Paul Fatout. Iowa City: University of Iowa Press, 1976: 238-40. Dickey, Marcus. The Maturity of James Whitcomb Riley. Indianapolis: Bobbs-Merrill, 1922. Nye, Edgar Wilson (Bill Nye). "Wandering Bill Nye. He Saunters through Ohio and Pennsylvania," Rock Island (Ill.) Argus, 23 November 1891, 2. Pond, James B. Eccentricities of Genius: Memories of Famous Men and Women of the Platform and Stage. New York: n.p., 1900. _____. Letter to Samuel L. Clemens, 28 June 1889, in the Mark Twain Papers, Berkeley. Partly reprinted in Albert Bigelow Paine, Mark Twain: A Biography (1912): II, 877.